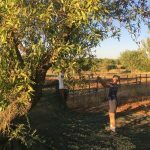 We have almost as many almond trees as olive trees at Rustic Puglia, and they’re laden this year so we’ve been busy harvesting them. It’s a much more relaxed affair than olives as there’s no rush to get them to the mill. Nets are spread under the tree and the branches are gently beaten to encourage the almonds to fall. We crate them up, take them to be dehusked, spread them in the sun to dry and then take them to the local cooperative which is buying them for €130 per 100kg.